ISO defines an asset as an item, thing or entity that has potential or actual value to an organization. ISO asset management standards have been written to apply to tangible assets (e.g. equipment, property, inventory, infrastructure, IT, human resources, etc.) and intangible assets (e.g. leases, options, brands, digital assets, intellectual property, legal rights, reputation, and agreements). Simply, asset management helps organizations better achieve organizational objectives while realizing greater value from their assets. Value: asset management does not focus on the asset itself, but on the value the asset can provide to the organization. Alignment: asset management translates organizational objectives into technical and financial decisions, plans and activities. Leadership: asset management seeks to enable leadership and organizational commitment at all levels to help realize value enabled by assets. Assurance: asset management gives assurance that assets will fulfill their required purpose. Context of the Organization: a statement of the organization’s mission, vision, goals and objectives in alignment with stakeholder needs and expectations. This is used to structure requirements that will be captured in a strategic asset management plan. This strategic plan provides governance for subordinate asset management plans. Leadership: leadership must be highly visible leading asset management activities in alignment with the strategic asset management plan. This requires clear policy, assignment of responsibility, and delegation of roles and authorities. Planning: a well understood, intelligent, and adaptive approach to translate risks and opportunities into well articulated asset management plans including specific objectives, actions, and criteria for success. This must be a continuous process. Support: asset management plans must be supported by resources, personnel competencies, situational awareness, effective communications, clearly stated requirements, and capable information / decision-support systems to be successful. Operations: asset management plans are carried out through operations that direct strategies, activities, and capabilities. This includes active management of resources in alignment with plan objectives and proactive change management solutions and strategies. Performance Evaluation: asset management systems must include thoughtful performance monitoring, measurement, analysis and evaluation activities. Performance evaluation systems include active, well described internal audits and management reviews. Improvement: asset management systems must also include systems and strategies to manage nonconformities and corrective actions, reliability-based preventative actions, and strategically organized continual improvements. The objective of the ISO 55000 series is to detail a framework on how to implement, leverage and advance asset management solutions and strategies. It does not provide, nor require prescriptive compliance with the standard, but does provide sufficient detail that may develop into an asset management assessment or certification process. The reason why organization’s may what to implement ISO 55000 is simply to improve organizational performance and save money and resources when doing so. General Relevance: ISO 55000 Asset Management applies to all performance objectives for organizations that are reliant on assets to achieve desired outcomes. It is a new, international standard based on decades of applied theory, systems development, laws, regulations, and business process evolution. A dominant source for the ISO standard is PAS-55 (publicly assessable standard) published by the British Standards Institute (United Kingdom’s national standards body). Early examples of asset management –based legislation in the US include CFO Act, GPRA, Clinger-Cohen Act for IT. 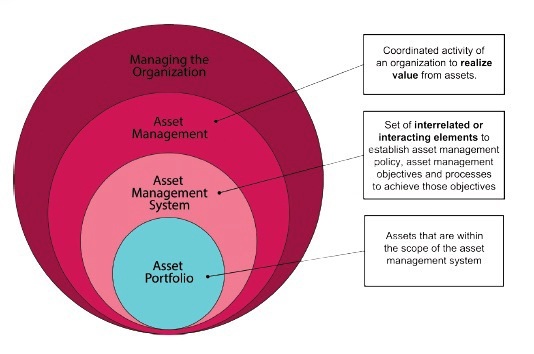 ISO 55000 recognizes asset management as a distinct professional discipline complementary to many other professional disciplines such as planning, design, program management, real estate management, facility management, and operations and maintenance management. The intention behind its release is to do for asset management what the ISO 9000 series has done for quality management and ISO 14000 has done for environmental management. Organizations truly interested in making fundamental and sustained improvements to their asset management solutions with the objective of improving organizational performance will be interested in applying ISO 55000-based strategies to do so.